Doves are a symbol of the Holy Spirit and of peace. The dove as a symbol of peace is derived from the dove which brought news to Noah of the flood having receded, enabling life to begin again on earth. Then, at the baptism of Jesus, doves were associated with the Holy Spirit as the Spirit descended on Jesus in the bodily form of a dove. 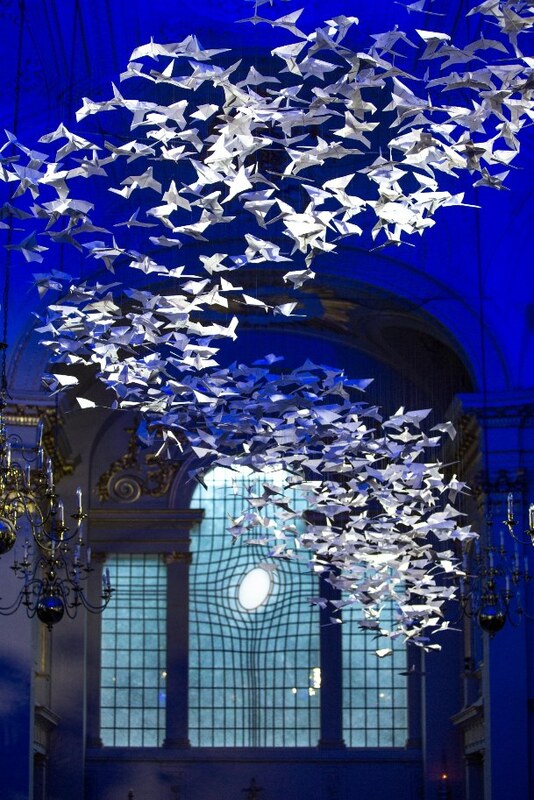 For Pentecost at St Martin-in-the-Fields in London two thousand white paper doves were hung in the nave forming a 15-metre-long paper sculpture called Les Colombes – The White Doves. 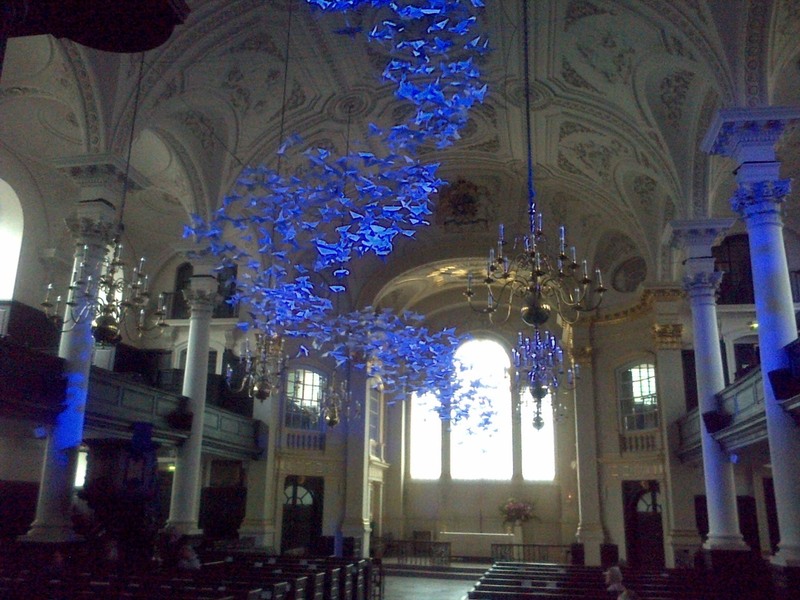 Light moved around the space and over the sculpture simulating the doves in flight. Quietly and playfully they integrated their movement into the atmosphere, exuding a magical sense of tranquillity and strength. A sound cloud, especially composed and produced for the installation by digital music producers Digital Haze, infused the space with the sound of cooing and fluttering wings, a gentle rustling of the wind and mystical chords which hovered in space, alternating between a strong intensity and an ebbing away. The installation, quietly, tenderly and intricately, opened up mystical space, offering a place of quiet reflection in place of the noise and movement that characterises public space in modern cities. Michael Pendry: Les Colombes – The White Doves, 2017, 2000 white paper doves, 15 m. Photo 1 is copyright Marc Gascoigne, Photo 2 is by Jonathan Evens. Michael Pendry was born in Stuttgart, Germany. He grew up in Munich and partly in England, where his father comes from; his mother is from Bayreuth/Germany. Pendry studied interior design, stage and set design at the FH Rosenheim and, for several projects, at the art academy in Munich. Das apokalyptische Weib for the Long-Night-of-Museums in 2006 and the light and video installations Sacre Coeur and Störung’ (Disturbance) have been some of the highlights in the career of this multimedia artist to date and showed his great innovative talent in finding new means of multimedia expression and catching the interest of thousands of people. Lighting the rotor blades of a nearly 100-metre high wind wheel just outside Munich in 2010 with Star of the South was definitely one of his most ambitious projects. With this project he also attained a new level in his public profile in the national press and media, even in France and Spain. Two of his latest installations, Les Colombes and Urban Paradise in 2014, also became popular successes and were reviewed throughout the media. For further information please contact info@pendry.de.